When Chuh A first laid eyes on Rex Ny nearly two decades ago, he just knew it was love at first sight. A was a 14-year-old who had arrived in the United States just a year earlier, transplanted from Kontum, Vietnam, to Greensboro, North Carolina. Ny, who was 12, was a fellow immigrant from Kontum; she had arrived at the age of 4. Vietnam has long discriminated against Montagnards for their ethnicity and Christian religion, according to human rights groups, and their US alliance during the war only intensified this persecution. Tony Ngiu, A’s 73-year-old father, spent nine years in hard labor at a Communist re-education camp after the war before making it to the United States. Tens of thousands of Montagnards assisted U.S. soldiers. An estimated 3,000 took refuge in the United States, according to the government-funded Voice of America, settling largely in North Carolina. She would decline his first three date invitations. “She didn’t pay attention to me,” recalled A, now 33. After not speaking for a year, A started politely peppering her with “corny” e-cards and messages from AOL Instant Messenger. She was amused and agreed to go out with him when he eventually asked again. He was now 16; she was 14. And they have remained committed to each other ever since. In 2005, Ny, then a high school senior, became pregnant with their daughter, Nya, now 13. The couple got engaged that same year. “After that, we just stayed together forever,” Ny said. They have three other daughters: Ly-Yhang, 12; Jolie, 8; and Evangeline, 6. A supported the family by working service jobs for companies including Golden State Foods and Ross Stores. Ny works intermittently as a manicurist. 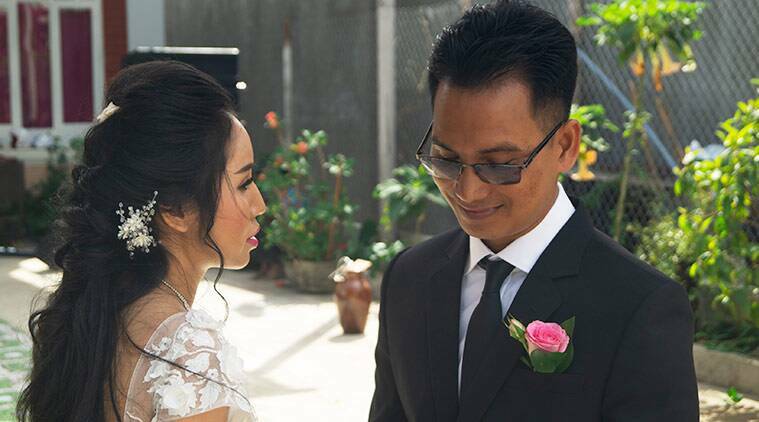 Sustaining their family at home and sending money to relatives in Vietnam forced them to put off a wedding. It also motivated A to make an ill-advised and life-altering decision. In 2013, he opted to “do something quick, a quick drop” and was subsequently convicted of trafficking ecstasy. He spent more than three years in prison. The conviction, although his first, was an aggravated felony and invalidated his green card, which granted permanent residency in the United States, rendering him eligible for deportation. Because Montagnards had long been unofficially exempt from deportation, A believed he would return to his American life after serving his prison sentence. But Immigration and Customs Enforcement, or ICE, detained him in June 2016. After a 13-month detention, he was deported to Vietnam. Ny and the couple’s four children are U.S. citizens and remained in North Carolina. But Ny remained committed to the couple’s engagement, despite suggestions from friends and family that maybe she shouldn’t. 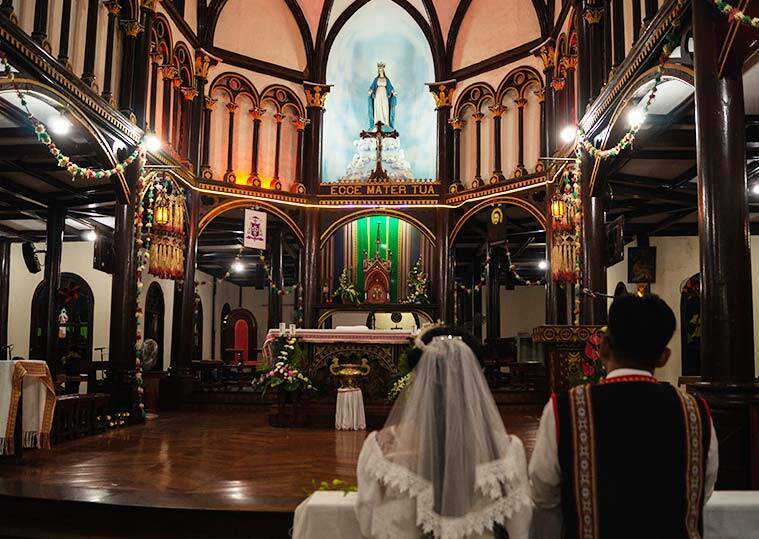 On Jan 26, the couple finally married in a 4:30 a.m. Roman Catholic Mass in Kontum. The ceremony was at the Immaculate Conception Cathedral, a century-old building known as the Wooden Church. As cool winds whipped through the city’s streets, more than 200 worshippers braved the dawn, packing the church’s pews for a quietly joyful ceremony. The couple hosted a raucous afternoon reception at Ny’s cousin’s home in a Montagnard village on Kontum’s outskirts. The couple have fought for their relationship since A’s deportation, pushing back against vast physical separation and the 12-hour time difference. They use FaceTime as much as possible, aiming to ensure that A’s children “don’t miss out,” as he put it. The couple had never expected to be separated. They both grew up in a Montagnard-heavy community in North Carolina, where deportation was unheard-of. Citizenship, A figured, wouldn’t have provided anything more for him than a green card. And by the time his parents were pursuing and achieved citizenship, he was working full time. Ny became pregnant around this time as well. Before President Donald Trump took office, Vietnam refused to accept Montagnard deportees. A, when detained by ICE, expected, like all those Montagnards before him, to be released after six months, in line with a 2001 Supreme Court ruling. But amid the Trump administration’s increase of Southeast Asian deportations, Vietnam acquiesced to U.S. pressure and, in 2017, began to take Montagnards. A is one of the first to return to Vietnam. (A’s three brothers never left Kontum province. Chuh A, who is the youngest sibling, was the only one who was underage, and therefore, able to emigrate with his parents.). Ny recalled a conversation with the parents of A after he was deported. In January, Ny and the couple’s four daughters made their way to Vietnam for a monthlong visit culminating in the wedding ceremony. A’s mother, Chok Y, 72, traveled from North Carolina for the wedding. His father stayed behind, unable to muster the necessary funds. Ny’s father, Antone Thinh, 71, attended, but her mother, Die Y, 68, stayed in the United States, preferring not to return to Kontum. The bride and groom are similarly aware of their good fortune relative to that of the impoverished Montagnard community. They invited the entire village to their reception, hoping not only to celebrate with but also to give back to their ethnic kin. Their guests feasted on freshly slaughtered and prepared pork and beef, along with an array of vegetables. The couple, in a Montagnard tradition, greeted every guest at the home of Ny’s cousin. Soon after, another tradition — of mandatory intoxication — began. A and Ny, despite spending the majority of their lives in the United States, speak various Montagnard languages, along with English and Vietnamese, and care deeply about their increasingly threatened community. “This is our culture and background,” she said. 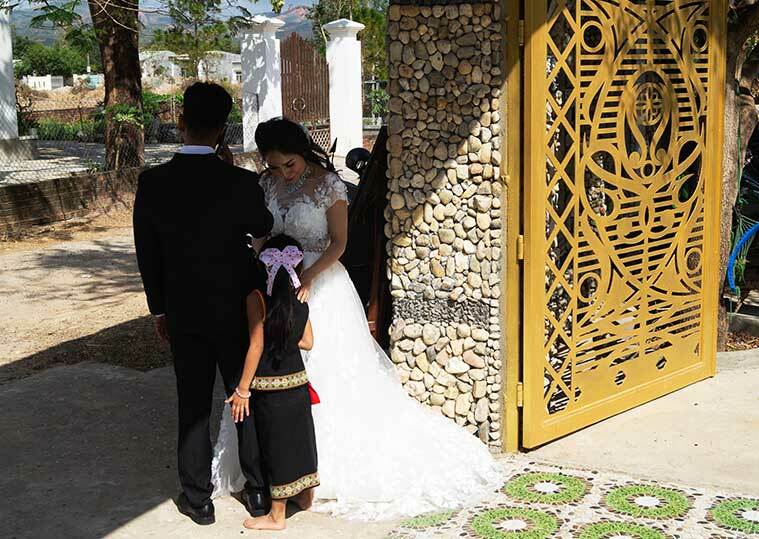 “When our kids see this, they know that this is their background as well, that they’re part of this.” Nya and Ly-Yhang, the couple’s two oldest daughters, don’t speak any Montagnard languages but nonetheless appreciate their parents’ union and their own heritage. On Jan 31, Ny and the couple’s daughters returned to their home in North Carolina. A remained in Ho Chi Minh City, the former South Vietnamese capital that was known as Saigon, where he works at a restaurant. It is unlikely A will ever again step foot in the United States, the country that his wife, daughters and parents all call home. Nguyen says he is pursuing this strategy. Where: The ceremony was at the Roman Catholic Immaculate Conception Cathedral, known as the Wooden Church, in Kontum. East and West: The couple rotated between traditional Montagnard and Western attire. Ny wore a white dress with tribal stripes for the church ceremony. She greeted reception guests in a flowing, white Western dress. A matched her in a pristine Western suit. He covered his pressed white button-down and black tie with a tribal-patterned vest during the ceremony. Languages: A and Ny understand English, Vietnamese and Montagnard dialects. They speak mostly English with their children, who still know select phrases in certain Montagnard languages, like “brush your teeth.” The church ceremony was in the Montagnard dialect Bahnar. Homemade Feast: For the reception, the couple’s family slaughtered and prepared three pigs and a cow, and served them alongside an array of vegetables. 1 Valentine's Day: Does love thrive in solitude?